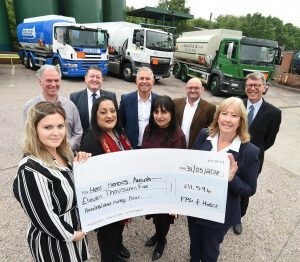 The Federation of Petroleum Suppliers (FPS), together with Midlands-based heating oil distributors, AID Fuels, Nolan Oils and Midland Fuels Oils have been fundraising to help those in fuel poverty and have awarded £11,594 to four National Energy Action Heat Heroes Award winners. The Heat Heroes Awards aim to recognise individuals who have gone 'above and beyond' to help people living in fuel poverty in their local community and are organised by charity National Energy Action (NEA) who work to end fuel poverty in England, Wales and Northern Ireland. The FPS and its members raised £11594 from two years of fundraising events and in that time asked West Midlands charity The Heart of England Community Foundation to administer the funds. The Heat Heroes Award winners chosen to receive £2898.50 each are Natalie French, Fuel Poverty Advisor for Coventry Citizens Advice Bureau, Russell Bosanko, Financial Capability Officer for Citizens Advice Derbyshire Districts, Alvina Ali, Energy and Climate Change Officer for Wolverhampton Homes and Davina Allen, Project Manager for Marches Energy Agency. Guy Pulham, FPS Chief Executive says: "We heartily congratulate all the winners of the NEA Heat Heroes Awards 2018, but especially Natalie, Russell, Alvina and Davina who plan to do so much good in the fight against fuel poverty with the funds the FPS and our members have donated. "In terms of what the donations are being used for, Natalie French, Fuel Poverty Advisor for Coventry Citizens Advice Bureau, intends to use the donation to continue to support people through their telephone assessment and advice service, and can now help more people to save money on their heating bills and become more energy efficient, as well as help with other aspects of their lives. "Russell Bosanko, who is Financial Capability Officer for Citizens Advice Derbyshire Districts, helps people to save energy and is keen to help more and more people thanks to the recent donation. The money will be put towards staging a number of events and attending community events, to provide energy advice and support to those most in need of assistance with their fuel bills. "The third award winner, Alvina Ali, Energy and Climate Change Officer for Wolverhampton Homes has told us that thanks to the money her organisation has received she can address fuel poverty head on, by providing a series of initiatives, products and services that will help tenants and residents to budget and control their energy consumption. Our Home Energy visits are now seen as, and are an essential part of delivering a customer friendly solution and will give us the tools we need to help support and protect vulnerable residents who are living in fuel poverty whilst helping them to sustain their tenancies. "Davina Allen Project Manager for Marches Energy Agency supports vulnerable clients by finding ways to cut their energy bills, find good deals and reduce their fuel debt – and this money will support her work on fuel poverty, principally around providing additional resource for their independent phoneline service across Shropshire, Herefordshire and Southern Staffordshire. "We are pleased that with the help of our Midlands-based members, we've been able to raise a significant sum of money. We are so impressed by the extraordinary efforts made by these four winners and have no doubt they'll put the money to incredibly good use, making a big difference to those people living in fuel poverty in the Midlands area." Tina Costello CEO of Heart of England Community Foundation comments "We were delighted that FPS chose our Foundation to administer these funds. The Heat Heroes Award winners have done brilliantly to support those struggling in their communities and we are sure their fine work will continue!"